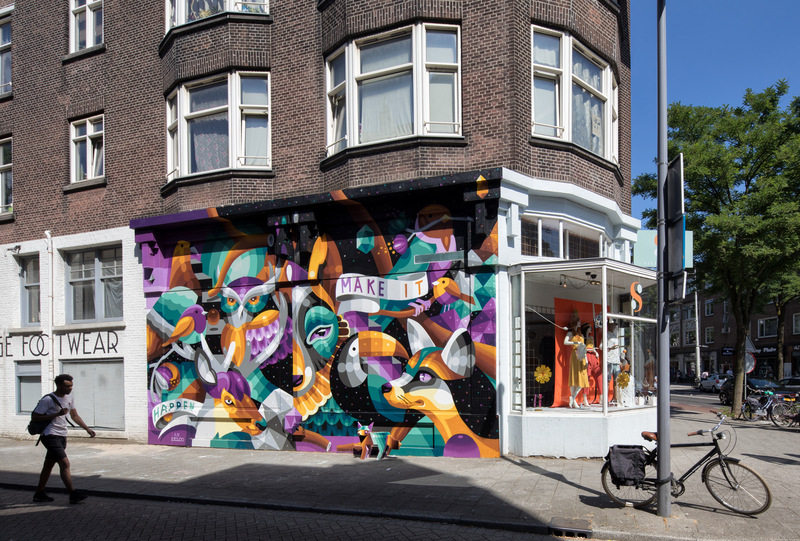 STREET ART IS BOOMING in ROTTERDAM! - Rotterdam. Make it Happen. 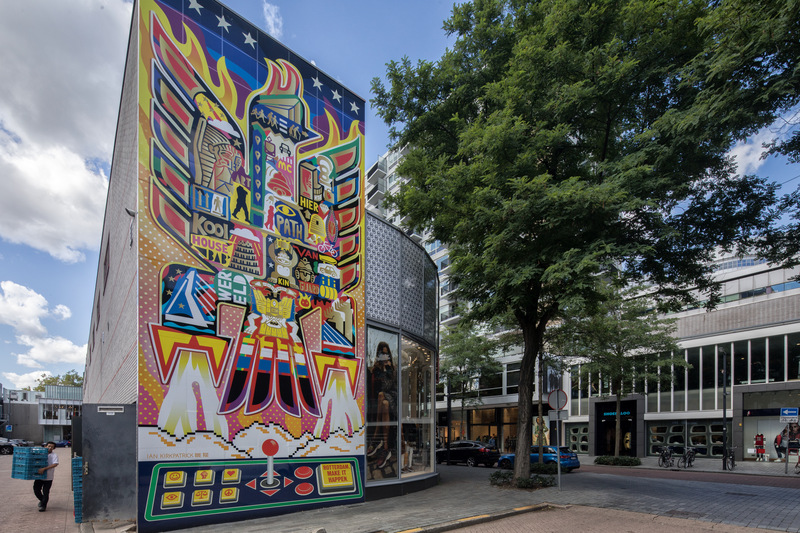 STREET ART IS BOOMING in ROTTERDAM! Street art is booming in Rotterdam. If you’ve visited Rotterdam, or if you live or work there, you must have seen a street art piece up close. Or else you have seen posts on Instagram, Facebook or Twitter. Tourists and Rotterdammers like to share photos or videos of street art pieces on their social accounts. 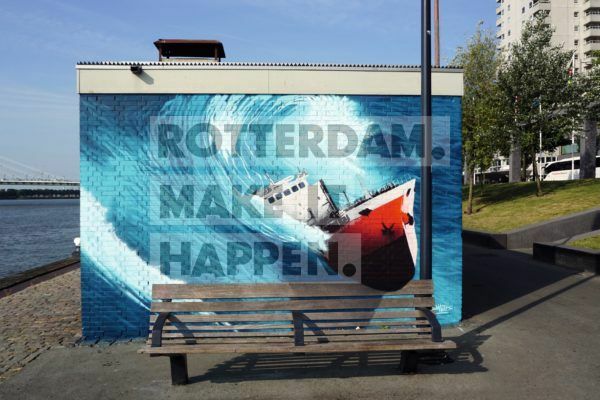 The interactive Rotterdam Make It Happen pieces, powered by Mothership, are regularly the subjects for social posts. Have you spotted them? In this article we’ll tell you where you can find these interactive street art gems. If you ride your bike alongside the Boompjes and the imposing boats that sail the Maas make you dream away, don’t forget to turn your head and check the quay. 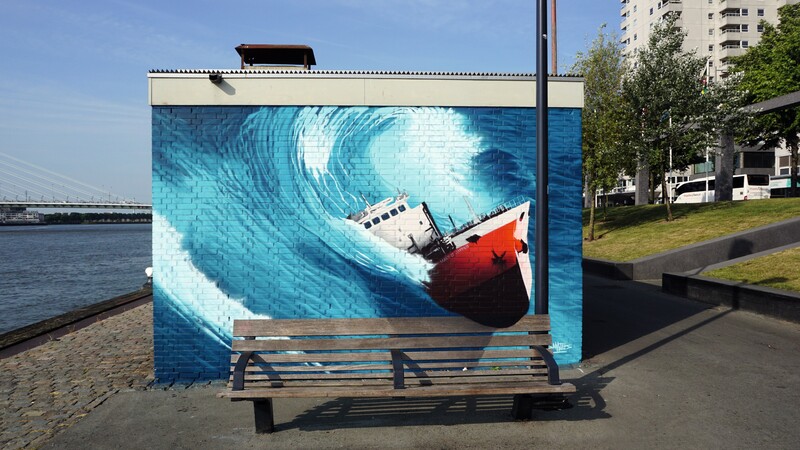 On one of the walls at the Boompjeskade you will find a street art piece of a fishing ship (artist Bart Smeets), trying to defy a heavy storm. All hands-on deck! The human pyramid of Daan Botlek at the intersection of the Schilderstraat and Schiedamse Vest in the city centre matches perfectly with the philosophy of ‘Rotterdam Make It Happen’. 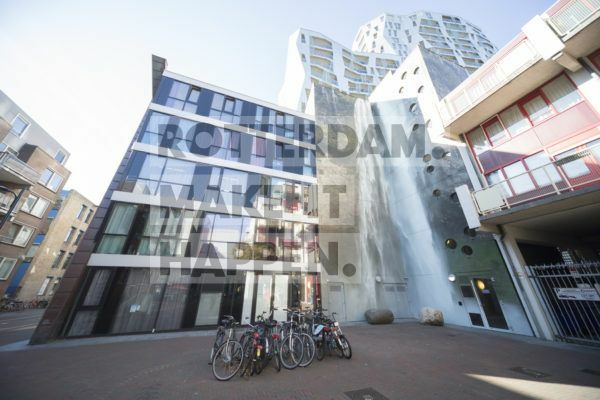 Rotterdammers that actively participate in the city and contribute to the city. You’ll find one link is missing from the piece, a link that us needed to connect all the ‘white men’ to each other and make the chain complete. Will you form that that link? Name one thing that the Dutch are known for internationally? Chances are you’ll say “cycling!” And you’d be correct. Rotterdam is no exception, you’ll see people riding their bikes left and right. Artist Calvin Sprague is like the Dutch, preferring the bike over the car. And you can ride with him! 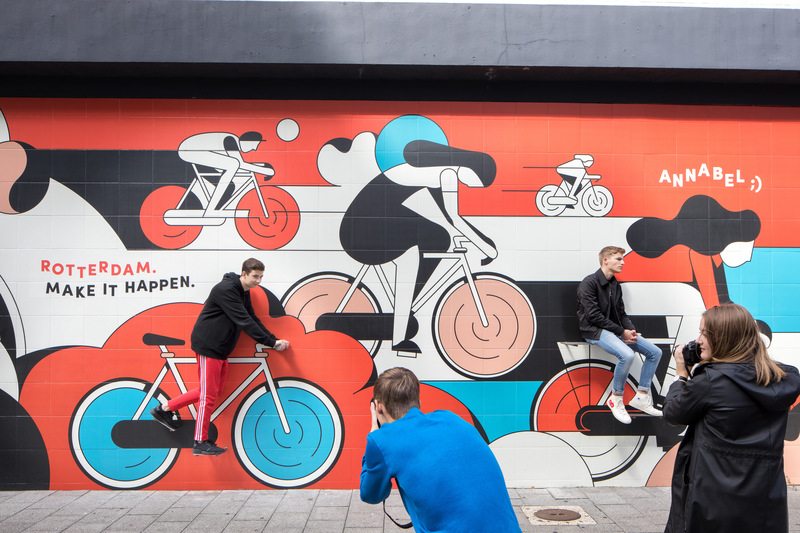 Just hop on one of his bikes, which you can find on one of the walls at the Delftsestraat. 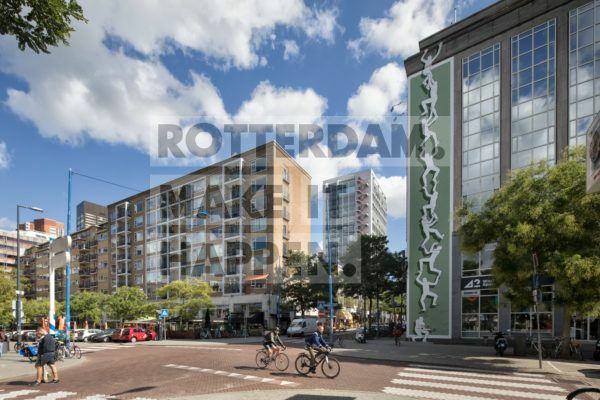 Rotterdam has beautiful and famous icons and landmarks. How about the Erasmus Bridge, for example? The Canadian artist Ian Kirk Patrick was inspired by the Rotterdam icons and decided to use them in his street art piece at the Kruiskade called the Phoenix. How many icons can you discover in this piece? At the Bloemkwekersstraat – corner of the Nieuwe Binnenweg – you will find a group of colourful figures. A dapper little fox in front of a wall depicting several of his animal friends, including an owl, a deer, a toucan, a sparrow and a dog. The aim of artist I am Eelco is to bring nature back to the city through his work. We think he’s doing just that! Artist Collin van der Sluijs knows better than anyone that Rotterdammers are hard workers. His grandparents are Rotterdammers so it’s in Collins blood. He created the work ‘City Swing’, a splendent mural with a ‘common tern’ as its centre. A common tern is a bird that lives and is often seen in the port of Rotterdam. For Collin this bird symbolises the work mentality of Rotterdammers, the port and the water that is always near when you’re in Rotterdam. You can find this piece at the Karel Doormanstraat. The Calypso residential towers are now inhabited, the Kruisplein and the Stationsplein are completed, the Mauritsplaats has been refurbished, but the bare concrete wall in the corner remained an eyesore. The residents around the Mauritsplaats felt it was high time a change and a makeover. They joined forces to decorate this bare wall and asked Mothership to help them. Artists Monique Benthin & Rick Messemaker heard about the residents’ project via Mothership and came up with Calypso Falls: a life-size photo of the Icelandic waterfall Seljalandsfoss, one of the most famous waterfalls in Iceland. 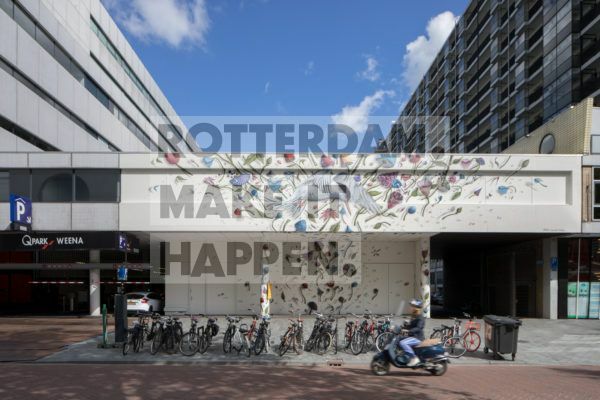 Forget about the hustle and bustle of the city, sit down on one of the Rotterdam Make It Happen rocks and imagine yourself in a different world!